On 28 December 2017, the FAO organised an awareness raising workshop for Members of Parliament in Brazzaville. Following the workshop, the participants established a structure to draft legal texts and set up the governing bodies of a Congolese Parliamentary Alliance on food and nutritional security. In her address to participants, the FAO representative in the Congo, Anne-Rose Suze Percy De Filippini, stated that she hoped the process would lead to a Parliamentary Alliance on food and nutritional security being in place by the end of the first quarter of 2018. It was her ambition that the Congo wold become the second African country to join the process, after Madagascar. Mrs Percy further recalled the Congo’s enormous potential for guaranteeing its population’s food and nutritional security, if only agricultural production were to step up and play its rightful role in the country’s development. “Unfortunately, and paradoxically, the food needs of the Congolese people have over the last few years been met through an explosion of imports. This influx has been due to poor agricultural production. The value of these imports was estimated at nearly USD 1.2 billion in 2016, and accounted for approximately 75% of the population’s food needs,” she noted. Faced with this poor track record, the parliamentarians were asked to commit to working for food and nutritional security. “There is clear evidence that food and nutritional security will be improved primarily through policies, programmes and frameworks anchored in food and nutritional security legislation. 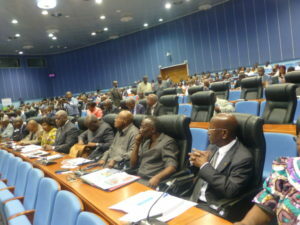 (…) It is Members of Parliament who are best placed to draw the attention of decision makers and constituents to issues of food and nutritional security at the highest level of the political and legislative agenda given, among other things, your legislative and budgetary responsibilities and your duty to monitor government action,” stated the FAO representative in the Congo. Among the 17 Sustainable Development Goals, it is notable that poverty elimination, zero hunger, health and well-being form a priority. And yet health, noted the second Vice-President of the Senate, Alphonse Boundo-Nesa, is dependent – among other things – on good nutrition. For his part, the second Vice-President of the National Assembly, Roland Bouiti Viaudo, stated that Congolese Members of Parliament were determined to produce food security policies. This could be seen, he noted, during the ordinary session of 30 October when the National Assembly publicly stated its political commitment to food and nutritional security and to legislating specifically on the right to food and to agricultural development.